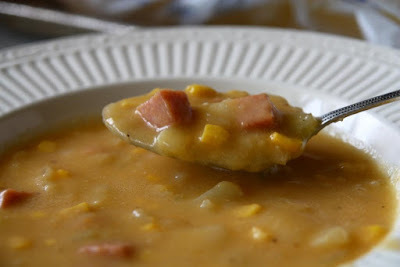 Making a House a Home: Corn Chowder and a GIVEAWAY!!!!!!! Mmmmmmm... nothing warms me up better than a bowl full of soup, stew or chowder. Today's recipe isn't just any old regular corn chowder, however. It's from an awesome book I just finished entitled A Life That Says Welcome by Karen Ehman- a book about hospitality and welcoming others into your home and your life. Thin with a little milk, if needed. Stir well. Serves 8-10. YUMMMMMM!!!! Warm and delicious AND my family loved it. What can get better??? Okay... so there's the recipe.... NOW for the GIVEAWAY!!!!!!!!!!!!!!!!!! For everyone that leaves a comment before SUNDAY NIGHT, DECEMBER 20th, before 8:00 pm EST, you get ONE entry. If you blog about this on your blog, too, then you can be entered TWICE!!!!! What is the giveaway???? Mrs. Ehman is graciously giving an AUTOGRAPHED copy of her wonderful book, A Life That Says Welcome!!!! Y'all will be so encouraged and challenged with this book! I love it and I am sure y'all will, too!!!! Please enter right away!! Sunday night will be here before know it!! I have the same dishes as you! Italian Countryside, right? Awesome giveaway. I'm planning on purchasing this. Looks so good. Thanks for the chance to win. I'd love to win, please enter me! I just made a version of corn & sausage chowder the other night. It was so yummy! I may have to try your recipe for a different twist on it. That book sounds lovely! May I be entered in the give-a-way? Thank you so much. Sounds like a great read. I love your dishes. I am on the hunt for a new set. The soup sounds delicious, and I'd love to win a copy of the book :o) Thanks, Mrs. U! Oh, I hope I win! I've been wanting to read this book, but our library doesn't have a copy. The corn chowder looks amazing. It's going on my Christmas Eve menu! The soup sounds delicious. Thank you for the recipe. I would love to win a copy of the book. Awesome giveaway. Thank you for the chance to win. This book has been on my reading list forever! I would love to get my hands on a copy! Being hospitable here is hard because everyone is so busy, working long hours and move so much that hospitality is an oddity, it is like people are in default to decline! So I am really working on this area and once Miss Pear is recovered from her surgery in January we plan on making this a priority. I would LOVE to win this book! Your dishes are beautiful and the chowder makes me hungry. I'm going to make the chowder this weekend. I would love to read her book. Would love to enter the giveaway! That corn chowder sounds wonderful, thanks for the recipe!!! Looks like a wonderful book! Please enter me! I've never heard of this book, but it sure looks good! I'd love to be entered, please! This is a new book and new author to me, but I'd love to read the book. Please enter me for the giveaway. Thanks! I just posted about this giveaway. Could you enter me twice? Thanks so much! This looks like a really nice keepsake book. Hope to win. This recipe looks delicious! Please enter me in the giveaway. Sounds like a great book. I've looked at some similair ones and plan reading several in the New Year. Thanks for the chance to win one! I was reading Deb's site and saw a chance for the book giveaway. It sounds like a book I would love to read and share with my daughter and my two daughters-in-love. I would love to read this book. Hospitality is an area I really need to work on in the coming year. Hi, I got the notice from Mrs. Michele B about your lovely give-away...I hope you don't mind if I enter. Your blog is lovely and your soup would be wonderful on a snowy day like we are having today! I would love to win this book! I can always use new ideas and inspiration for hospitality. Your chowder looks delicious! I would LOVE to be entered in your give-away as this books sounds fabulous!! The chowder looks yummy! The book looks like a great read! I would sure love to receive this book.....put my name in the hat !! The corn chowder looks delicious !! I would love to be included in the giveaway!! I love corn chowder!! I would love to read this! Thanks for the chance to win a copy. And the book looks so interesting, I may look into that one. Hello, this is my first visit to your blog so Ihope you don't mind my asking if I can be entered for a chance to win this book!? Are bloggers in the UK ekligible? is so, count me in. Just introduced to your blog and I can't wait to sit and read with a cup of coffee. Merry Christmas to you and yours! Ooh, I've seen this book recently and had really wanted to get it. Unfortunately... I didn't... but with your giveaway... maybe! I hope I am not too late! I would love to be entered! Hi there! what a wonderful giveaway. Hoping to win. I have this book on my Christmas wish list. Looks like a wonderful book and I would love to be entered. Thanks so much!